Flemmie Pansy Kittrell was born December 25, 1904, in Henderson, North Carolina. She was the first African-American to earn a doctorate in home economics (Cornell University, 1936). She became an internationally renowned nutritionist, providing nutrition education to governments at home and abroad, especially in developing countries. In 1947 she undertook a nutritional survey for the Liberian government, which presented Kittrell with a special award for her work. 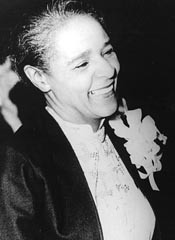 She visited Ghana in 1958, barely a year after the country had gained its independence, and presented eight lectures to classes of young social welfare officers in Accra, Koforidua, Kumasi, and Cape Coast in which she spoke about home economics among the African American community as well as in American society in general. 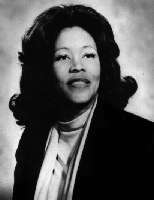 Flemmie Kittrell died October 3, 1980 in Washington, D.C.
Ruth B. Love was born April 22, 1943 in Bakersfield, California. The granddaughter of a runaway slave, she was the first black and first woman general superintendent of the Chicago public school system from 1981 to 1984. Later she moved to the San Francisco area and directed Ruth Love Enterprises, an educational consulting firm, and copublished (with Carleton Goodlett) a group of black weekly newspapers. Ruth B. Love has served as a Distinguished Professor and Coordinator at San Francisco State University and became a member of the Horatio Alger Association of Distinguised Americans in 1983. Clementine Reuben was born in December 1885 at Hidden Hill plantation near Cloutierville, Louisiana. By the time Clementine turned five, her family moved to another plantation in Cane River country, where Clementine attended school. She did not like school very much and often failed to attend, so after a while, Clementine’s parents gave up on sending her to school altogether. When she reached age fourteen, Clementine’s family moved once again, this time to the Melrose Plantation, to work for John Hampton and Carmelita Garritt Henry, also known as “Miss Cammie”. Melrose had been the center of Cane River for many years. It was a very large plantation, created by a former slave called Marie Therese Coincoin and her family in the late 1700s . The plantation had become known as an agricultural empire, with its thousands of acres of corn, cotton, tobacco and hundreds of head of cattle. The plantation was eventually sold to John Hampton and “Miss Cammie” (Carmelita Garritt Henry) in 1898. Miss Cammie desired to preserve the arts and crafts of the Cane River area, and over the years Melrose became a haven for many artists and writers. They came from all over to work in the quiet relaxing atmosphere, and all were encouraged by Miss Cammie. 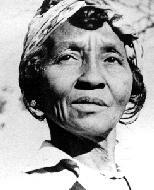 Clementine and her family worked on the plantation in the cotton fields and the pecan groves. Clementine married twice. Her first husband Charlie Duprie died in 1914, leaving her with two children to raise. Ten years later, she married her second husband Emmanuel Hunter and the two of them had five children, but lost two at birth. Clementine took her babies to the fields with her so that she could check on them while picking cotton. Then, in 1928 Clementine was promoted from the fields to the house. She looked after the gardens and the laundry and she made clothes for Miss Cammie’s children and their dolls. She also created marvelous quilts in beautiful rich colors. It became clear that Clementine had hidden talents. Life was good and it got even better. In 1938 a man named Francois Mignon joined the Melrose family, working as a literary assistant to Miss Cammie. From day one, Francois recognized the creativity in Clementine Hunter, and it was due to his encouragement that the now 54 year old woman began painting. As the story goes, Clementine remarked one evening to Francois “I could do a painting if I set my mind to it.” Francois gave her some paint, and the next morning she presented him with a painting . From that day on she received small amounts of paint from visiting artists and the rest is… well, history. For the next forty some years, Clementine produced 4000 paintings, each one telling a story of life as she saw it in a simple, straightforward way. She did not always have canvas so she used old window shades, bottles, cardboard and brown paper bags. She was illiterate, but her paintings were her storybook – a storybook about everyday life on and around the plantation. After all her hard work, Clementine received an Honorary Doctorate of Fine Arts by Northwestern State University of Natchitoches and her name is preserved in the famous walk of stars in the city of Natchitoches. thank you for your post about my aunt Flemmie Kittrell. Thank you for the post on my Family, Flemmie Kittrell. I am finding out a lot about my family.